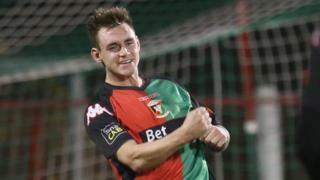 Recent signing Chris Lavery scores a hat-trick as Glentoran beat Ards 4-1 in the fifth round of the Irish Cup. Lavery was making his home debut for the Glens after joining the Premiership team from Lurgan Celtic. Glentoran's win puts the holders through to a sixth round tie at home to 2014 Glenavon.